YPG Book Club: And the Winner Is. 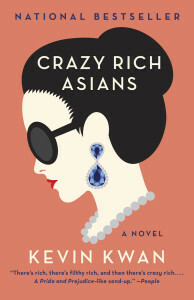 . .
You voted, and the first selection for the YPG Book Club is: Crazy Rich Asians by Kevin Kwan! Get started reading, and we’ll notify you through the newsletter for details about our first book club meeting in October. Please contact Danielle (Danielle.Kolodkin@harpercollins.com) and Heather (Heather.Allen@harpercollins.com) with any questions!